About 1870 Moses Pullen, 50 years old teacher of Southwick (near Shoreham, Sussex), commenced his work on an adding machine. On 4 June, 1874, a British Patent No. 1948 was granted to Moses and his son William Pullen, of High Bentham, near Settle, in the county of York, for an invention of a keyboard one-column adder, called by the inventors A new or improved machine for adding together and ascertaining the total of a column or number of figures. The patent was sealed on 1 December of that year, the same month Pullen applied for a patent in France, and it was granted (patent FR105997) on 1 March, 1875 (see the lower patent drawing). In 1875 a company, The Bentham Calculating Machine Company Limited, was established for the manufacturing of the machine. The 5 June, 1875, issue of the Lancaster Guardian newspaper reported a message, that the list of applications for shares in the company would close on 16 June, the capital being £10000 in 2000 shares of £5 each, and a copy of the Prospectus (advertisement) was pubished. The Prospectus emphasized that the machine of Pullen was simple in construction, light, portable and elegant, and it was adaptable to any particular business. It was suitable to those to whom the process of addition is laborious and irksome, and it will not fail to be noticed that a little boy or girl may be employed to add up or check the totals of journals, ledgers, etc. One can only agree that there are some persons whose brains are so active that nothing can exceed the rapidity with which they run up a column of figures, but even these soon tire, and their energies are impaired by excessive use, and they would act wisely in availing themselves of the assistance these Machines afford. Three forms of the machine were to be made, costing from (around) half a guinea to four guineas. Weaving, hat and nail-making, and other local trades have passed away, and the only businesses which have sprung up since their decadence are the Bentham Gas Works, and Messrs. Pullen and Procter's manufactory of calculating machines. The machine, which was invented by Mr. Pullen and Son, occupied about five years in bringing it to its present perfection. The patent of it, which embraces Great Britain and Ireland, the Isle of Man, Belgium, the Channel Islands, and France, and all her colonies, was sealed on the 14 of December, 1874. In a week or two the patent, works etc., will pass into the hands of a limited liability company. The newly erected manufactory for the making of calculating machines is on the margin of the Little North Western line on the south side of Bentham station. The dimensions of the building within are 30 yards by 15 yards. The building consists of first and second floors, with six lights in each room. The working machinery on the first floor is a horizontal engine of four horse power nominal, by Tangye, and Bros., three turning lathes, punching and stamping machines, a circular saw, grinding stone, a brass plate polisher etc. The circular saw, though small, has an astonishing cutting power, and it quickly severs solid cylindrical or flat pieces of brass. The punching machine is an ingenious apparatus for making half or any other defective hole which could not be done by the hand. The calculating machine is a neat instrument fixed on an ornamental frame, made either of mahogany, rosewood or walnut. The frames are either square or oval. There are three kinds of calculating machines, all under one patent, as the principle is the same in them all, and the difference is in their arrangement. The price of the first is four guineas, the second two guineas, and the third 10s. 6d. The last named machine is an exceedingly simple arrangement, and it is very suitable for small shopkeepers. The machines are all fitted up with a neat polished cedar-box. The works, in addition to the proprietors, give employment to two men and two boys. The invention of the machine, and its neat and portable construction, reflect great mechanical skill on the part of the inventors, and as a reward for their ingenuity and perseverance one hopes that the undertaking will be one of marked success. The object of this invention is to add together and calculate or ascertain the total of a column or number of figures, whether such column or number of figures relates to abstract or concrete qualities. For this purpose we employ a dial or table mounted on an axis capable of revolving at intervals. This dial is divided on the surface into compartments, which are numbered decimally or in degrees of ten. We also employ another and smaller dial, which is divided into ten parts, and marked with the number of the units. Affixed to the axis of the first mentioned dial or table is a toothed wheel having the same number of teeth as there are divisions on the dial, and on the axis of the smaller dial is a either worm or pinion wheel gearing into the aforesaid wheel; also on the said axis is a ratchet wheel, into which enters a catch mounted on the dial for purpose herein-after explained. There is also on this axis a pinion which gears with a toothed rack attached to a slidable plate or bed capable of being moved backwards and forwards by the hand of the operator, the length of stroke being regulated by a series of slide stops or keys numbered in a manner corresponding with the units on the small dial; or instead of the slidable plate the slide stops or keys may be made of different lengths, or to more different distances when operated upon according to the number which each represents, and so act upon and turn the dials, but we prefer the slidable plate arrangement. The mechanism may be provided with a suitable cover having apertures through which the figures on the dial can be seen. The method of working is as follows: Suppose it be required to add together the abstract numbers five and nine the operator passes down the key marked five, and draws back the toothed rack as far as the catch of when the figure five will appear through the aperture for the smaller dial. He then pushes in the rack to its original position, the axis and pinion turning round but the dial remaining stationary by reason of the arrangement of the ratchet wheel and catch. 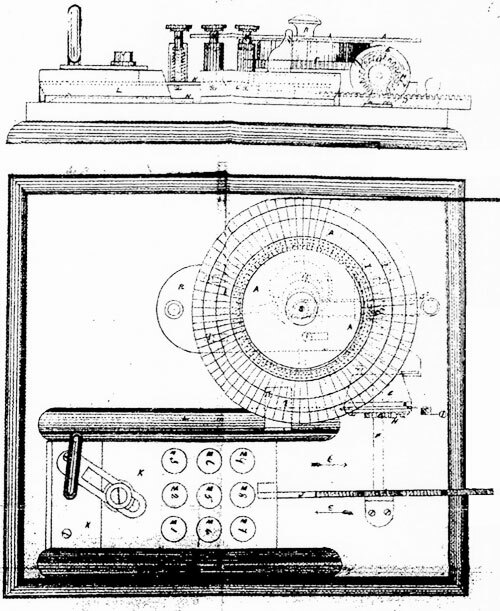 He then removes his finger from the key number five, and places it upon key number nine, and repeats the operation of drawing back the rack, and the result will be that the small dial will have performed one revolution and a part of another; also by means of the worm or pinion on the axis of this dial the larger dial will have been moved round to the extent of one tooth or division; therefore the number indicated by the large dial will be ten, and that by the smaller dial will be four; the total indicated by the two figures on the two dials being fourteen, and so on with any number or series of figures in succession. Whatever be the number of figures added together the result is always given by adding together the two figures or numbers indicated or shewn by the two dials. We also construct a very simple apparatus on a similar principle to the foregoing of two discs of cardboard or other substance mounted on the same axis, the upper disc being smaller than the lower, the lower and larger disc being mounted with the units from one to sixty, and the upper with the units from one to ten, the figures only occupying one-sixth of its circumference. Opposite each number on the larger disc is a hole, into which a pin can be inserted, by which the disc can be drawn round on its axis to a certain place or fixed point where the total of the series of successive figures are indicated. The sealed patent specification from December, 1874, was in much greater detail, referring to a large accompanying sheet of drawings. It explained that the dial of cardboard could be divided radially into 77 compartments or divisions, which radial divisions are divided concentrically into three parts. The outer row of divisions contains abstract numbers in tens from ten to seven hundred and sixty. The next inner one contains the amounts in shillings and pence, corresponding to the number of pence indicated by the abstract numbers aforesaid, and on the same principle the inner or third division contains the total of a given number of pounds expressed in quarters and pounds. Other dials could be affixed, denoting lineal, square, cubic or liquid measures. Little is known about the inventors—Moses Pullen and his son William (info found mostly in British national census databases). Moses Pullen was born in 1821 in Manchester. Nothing is known about his childhood and education, but in 1841 he worked in Bolton as a mechanic. By 1851 he was a National School master. Moses' son William was born in 1856 in Painswick, Gloucestershire. In 1861 Moses, still a National School master, his wife Ann, his father, seven daughters (born in Lancashire, Cheshire and Shropshire, so Moses was clearly moving around a good deal for work) and his son William aged 5, were still living in Painswick. In early 1860s Pullen taught science classes in Cotswolds, and there in 1864 his pupil was Alexander William Bickerton (1842–1929), who later became a famous New Zealand chemist and astronomer. By 1871 the Pullen family was living in Southwick (near Shoreham, Sussex), with five daughters still at home, Moses working as a teacher. At this time William was a pupil teacher living with an elder married brother, a schoolmaster, in Norfolk. During the above-mentioned events of 1874–1875, Moses was temporary headmaster of Bentham Grammar School (an independent school in Bentham, North Yorkshire), resigning in May, 1876. In 1881 Moses, a widower, was in Leeds, with four unmarried daughters still at home, all five engaged in hosiery manufacture. In 1891 the census records Moses Pullen in the Elland area (near Halifax), working as a manufacturer of rugs, still with six family members in his household. Moses Pullen died in Halifax in 1896.